Funds publish net asset values daily. 1. 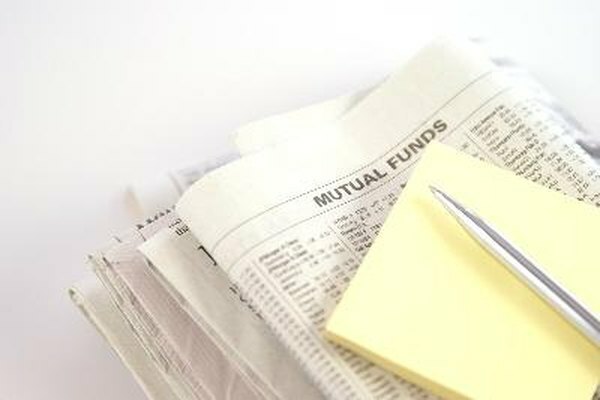 What Is a Mutual Fund Unit? 3. When Are Mutual Fund Prices Updated? With the different types of investment funds, there may be a distinction between the net asset value and the share price. The difference between the share value types could have a significant impact on your investment returns. At a minimum, you should understand what is going on when you look up the values of your favorite fund. Each investment fund calculates the net asset value -- NAV -- of a share by adding up the value of all the securities owned by the fund divided by the number of outstanding shares. Mutual funds, closed-end funds, exchange-traded funds -- ETFs -- and unit investment trusts all have a net asset value. The net asset value of a fund is calculated once a day, usually soon after the stock market closes. The NAV can be viewed as the amount of money investors would receive per share if all of the securities owned by a fund were sold and distributed to the shareholders. With mutual funds and unit investment trusts, investors buy and sell shares -- or units -- at prices directly related to the NAV. With a no-load fund, both purchases and sales are completed at the NAV price. With load funds and unit investment trusts, the purchase price will be the net asset value plus the load or sales charge percentage. All transactions involving these fund types are completed through the fund company at the end of the day after the daily NAV has been calculated. The shares of exchange-traded funds and closed-end funds trade on the stock exchanges in the same manner as common stock shares. Exchange trading allows investors to buy and sell shares of these fund types throughout the market day. Market share prices can change during the trading day. ETF and closed-end fund shares are only bought and sold on the exchanges through a brokerage account. The sponsor companies behind the funds do not sell and redeem shares for retail investors. Share prices of securities trading on the stock exchanges are highly influenced by supply and demand forces. As a result of these forces, the share price of an ETF or closed-end fund can trade at a premium or discount to a fund's NAV. The market price of ETF shares usually stays within a few percent of the NAV price. The ETF companies provide intraday values similar to the day-end NAV. The market price of closed-end funds can reach significant discounts or premiums to NAV. Variations of more than 10 percent are not uncommon. At the time of publication, the greatest closed-end fund discount was 29 percent and the largest premium was 78 percent above the NAV.